On days like today, soup is one of the few things that can really warm you and get right to the heart of the cold. We are lucky to all be sitting indoors, warm and dry whilst watching the "oh my goodness, there is snow in the south" drama unfolds on television. My mum is from Lancashire, my father from London. We were brought up in London but spent many of our holidays under the age of 11 in Lancashire at my grandpa's house, the house my mum grew up in. Not being a Coronation Street viewer as a kid, this type of house, street and town were completely alien to me: row after row of 2-up, 2-downs with a lean-to kitchen, outside loo and coal store. The dark-roofed terraces clung tightly to the steep hills running down to the mills in the town at the bottom of the valley. I was far more familiar with a landscape of wide suburban street with tidy front gardens, pampas grass and polished cars in the drives of red-brick semis and bungalows, or ostentatious faux-georgian detached houses with white marble fountains & statuettes on their ludicrously tiny attempts at "sweeping drives". There was never enough snow in the outer London suburbs when I was a kid. Mum used to commiserate with us (whilst thanking God that she didn't have to stay home from work with us too often!) and tell us stories of heavy snow, woollen stockings and long walks to school. We didn't have much truck with the long walks bit as we walked a mile and a half to school albeit in waterproof coats and poly-bag lined shoes. The snow though, we envied. As head of science at a girl's school across the Pennines, she would drive her Morris 1000 over the hills, behind the snow plough and says that she doesn't recollect a day when she didn't make it in to school eventually. For most of this winter's cold spell, she has managed fine, living alone in Derbyshire. We managed to persuade her to come to us for Christmas after her own Christmas plans fell through. Unsuprisingly, we had to rescue her from Tonbridge station as they didn't even bother to run trains south on the day of her arrival. Right now, she is at home looking out onto about 15 inches of snow. She has gritted her paths, shovelled snow away from her garage doors and her neighbours have cleared tyre tracks down to the main road. They have gone to work at the county offices some ten miles across the moors, scarcely batting an eye-lid at the snow. Down here on the south coast, we have had to close the bakery because the industrial estate hasn't seen a gritting truck for, well, I am not sure how long. Getting in this morning was difficult and as the snow continued to fall the tyre-tracks on the road disappeared into the soft white velvet layer. After watching a 4-wheel drive and a quad bike almost come to blows outside, we decided it was sensible to beat a hasty retreat. As the snow continues to fall this afternoon, I think of Mum and her sensible matter-of-fact attitude to the weather and think that we could use a whole lot of people like her down here, preferably running our councils! To the matter in hand - soup! There was always a pan of soup on the go when I was a kid, but I could never get a recipe from mum, that wasn't the way she worked so that is how soups have developed with me. What is in the fridge? what needs to be used up? OK, celery & stilton soup, bacon and green pea - see how it works? I don't really get the idea of a recipe for a soup as I don't think that there are any hard and fast rules to soup-making, unlike baking, where technique and volumes matter enormously. I made this on yet another cold day and let it sit on the hob on a super low temperature (lower than a simmer) until it was wanted. By the time we got to it the flavours were rich and concentrated which balanced perfectly with the others cheesy croutons, yet still worked for my un-adorned bowl. caramelise the onions by adding them to a hot frying pan with the butter or oil melted. place chunks onto a lined or greased baking tray and bake in the oven for 15-20 minutes, give them a quick shake if you remember about half way through. *when i can't be bothered with the grill method, we make the croutons in a non-stick (important) frying pan by dry frying and then just chuck some cheese over and allow this to melt on the croutons and the pan before tipping the whole lot over the soup. it tastes the same but without the aggravation ... and sometimes that is all that counts! Funny, my mum would laugh if she heard your description. She would agree, used to inflict ACG&S on us as kids (location spotting!) it was the only time you heard her say "shhh"!. As a result of watching, I developed a taste for fatty bacon and piccalili that I have never lost and spent many wasted hours teaching myself to play the theme tune on the piano! I was wondering what to have for tea and now I know. 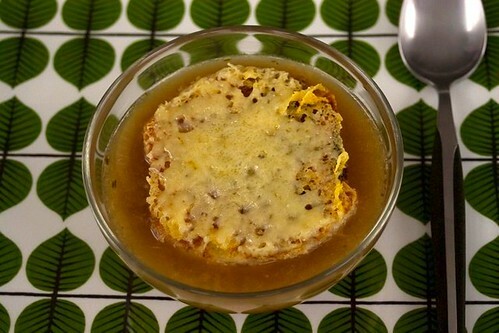 I am off to make French Onion Soup right now, just the remedy for the freezing temperatures.